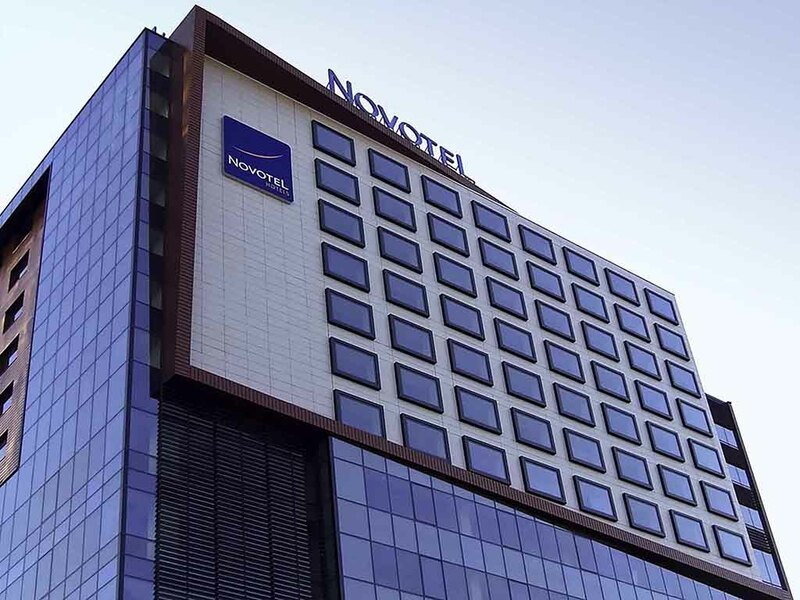 Novotel Sofia is a great place to stay in capital's main business district with easy access to The MALL and Sofia Tech Park business area. This new 4-star hotel provides the latest generation accommodation and meeting rooms with state-of-the-art equipment. Plenty of entertainment options at the adjacent mall and beautiful views of the city and Vitosha Mountain make doing business at Novotel Sofia a pleasure! The Sofia city centre is rich in numerous historic artistic and cultural sights. Discover the ancient city of Serdika, St. Alexander Nevski Cathedral, St. Sofia church, the Central Military Club, the National Theatre. A sensual journey through time. Have the best breakfast in town in our modern restaurant or at our fancy bar. Our standard double rooms of over 24 sqm combine modern decoration of the latest Next rooms generation with air conditioning, satellite TV, direct telephone, free WiFi Internet access, minibar, safe tea and coffee facility. Up to 2 adults + 2 children A unique experience combining relaxation and focus. The Next Executive room treats you like a VIP: Nespresso machine, bathrobe, slippers, cosmetic amenities, minibar, free WiFi Internet access. Very spacious room of over 39 sqm with large salon. I can describe my relation to the Novotel with few words: For me is Novotel the best hotel in our capital city of Sofia. All us perfect - location, rooms, breakfast, service! I recommend the Novotel to all people, who travel by car to Sofia. The hotel's own underground garage is free of costs for the hotel's guests. once told the staff to get a silent room, ever since then I get a room at the same area, perfect for me. Friendly and helpful staff ( thanks for the fresh juices , Mira) , free underground parking , spacious rooms with good wi-fi connection , clean bathroom. Nice food and good service in the lobby restaurant. Beautiful and elegant hotel with very kind staff. We enjoyed every minute of of stay. The staff were exteremely kind and helpful. The hotel was very modern, comfortable and clean. Breakfast was very good. All staff were welcoming except for the Bar Staff who were very impersonal. We spent a lot of time at the Bar every evening. It was like every order we made was the very first time they met us. Novotel is preferred hotel due to, clean rooms, good beds, Friendly and helpfull staff. The food however is overpriced, but good. Makes you feel at home and comfortable when you are on a business stressful trip. The team is helpful and friendly. Clean room and importantly the comfortable bed. (good for people with back problem). Everything as expected. Nice bed, good pillow, Quiet room, great breakfast, efficient and friendly staff. Almost everything has been great, but that you do not provide a chance to see Championsleague matches on Tuesday was really very, very disappointing and not appropriate for a hotel of your class. Bad enough not to providing at on the TVs in room, but not even in the bar was hardly acceptable. Perfectly located for office and ad-hoc shopping. All factilities as expected and available. Very good experience @your hotel. Sort by nice stay @novotel. Clean and comfortable room. Good breakfast. Fast check-in & -out. Most things were great: room clean and comfortable, check-in/out efficient. Food in the restaurant tasted good, as did room service dinner but the room service meals were not hot enough and this spoiled them. I was also surprised to be charged 31 LEV for an airport taxi pickup (late night). Previously this has not been billed and besides this it is 10 LEV journey - maximum. Your hotel was clean and up to date. The room was a good size. The restaurant was ok. Wish you would bring back the traditional Shopska Salad. It was much better that the one you serve today. Hotel staff were nice and friendly too. As usual at Novotel Sofia the overall experience was pretty good. I have stayed here on many occasions, for various lengths and in different rooms of all standards. This was just at 2-night stay and, although the room was OK, it was possibly the worst I have had in this particular hotel in terms of the view and facilities. hat's not to say it was bad as I have had far worse in other hotels. Friendly, welcoming staff, clean facilities, upgrades are improving the hotel. I use the hotel frequently, and find it consistently comfortable. Overall, the personnel there are welcoming and helpful. I use the Novotel in Sofia as well, and find the same there. It is a strong point of the hotel(s). As always hassle free and the reception team polite and helpful. Hristo in the restaurant is extremely customer focused and was helpful regarding the menu - one in particular for recognition. Thank you again for a pleasant stay.